Royal Caribbean launched its Mediterranean cruise season with Liberty of the Seas cruising out of Naples and Legend of the Seas sailing from Genoa and Civitavecchia. Yesterday Legend of the Seas began its 2013 season in the Mediterranean from the port of Civitavecchia, offering a 7-night itinerary to the western Mediterranean, with stops in France and Spain. 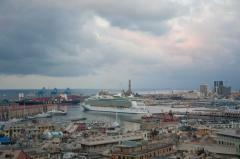 Last Friday saw Liberty of the Seas at the port of La Spezia, where she began her cruising season. Liberty of the Seas will be calling 27 times during 7-night itineraries along the Western Mediterranean route and transport more than 98,000 cruise passengers. In June, Liberty of the Seas will officially begin cruising out of her new home port of Naples. Royal Caribbean announced today its 2014 Mediterranean cruise schedule, which brings the total to eight cruise ships that will call Europe home in 2014. Liberty of the Seas, Navigator of the Seas, Serenade of the Seas, and Splendour of the Seas will sail the Mediterranean and compliment the previously announced Independence of the Seas, Adventure of the Seas, Brilliance of the Seas and Legend of the Seas in Northern Europe. Royal Caribbean’s 2014 Northern Europe cruises will open for booking on March 20, 2013, followed by its Mediterranean cruises on March 28. Most of Royal Caribbean’s 2014 Europe fleet will have undergone the cruise line’s fleetwide revitalization program to bring their ships upgraded onboard options such as new restaurants, entertainment and upgraded staterooms. Liberty of the Seas will sail roundtrip from Barcelona on a seven-night, Western Mediterranean itinerary, calling at Provence (Marseilles) and Nice (Villefranche), France; and Florence/Pisa (La Spezia), Rome (Civitavecchia), and Naples/Capri, Italy. The Aug. 10 sailing calls at Cannes, France, instead of Nice. A four-night, roundtrip itinerary departing May 14 will offer vacationers a taste of the Freedom-class experience, with a call at Nice and Florence/Pisa. An eastbound trans-Atlantic sailing on May 1 and westbound on Oct. 26, both 13-night itineraries, will bookend Liberty of the Seas’ Europe season. Navigator of the Seas will homeport at Rome (Civitavecchia) to sail a seven-night Eastern Mediterranean itinerary, which calls at Sicily (Messina), Italy; Athens (Piraeus) and Chania (Souda), Crete, Greece; and Ephesus (Kusadasi), Turkey. Alternatively, vacationers have a second option to embark on their seven-night Eastern Mediterranean cruise, sailing roundtrip from Sicily (Messina). Additionally, vacationers can choose a 15-night Galveston to Rome or 14-night Barcelona to Galveston trans-Atlantic cruise, sailing May 4 and Nov. 9, respectively. acationers also can embark on longer nine- to 12-night Italy, Greek Isles and Turkey cruises from Barcelona from May through August, and Venice from late August through October. From Barcelona, Serenade of the Seas will alternate 12-night Mediterranean Greek Isles and night Mediterranean Venice itineraries the latter featuring an overnight in Venice. From Sept., Serenade of the Seas will homeport in Venice and alternate 10-night Greek Isles and 11-night Greece and Turkey itineraries. 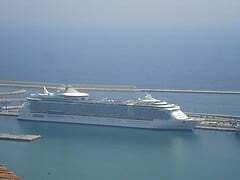 Vacationers also can sail into Europe with Serenade of the Seas on a 16-night trans-Atlantic cruise from New Orleans to Barcelona on Apr. 26. Vacationers also can choose a nine-night eastbound sailing from Barcelona to Venice on Aug. 27 and a 10-night westbound return on Oct. 27, takeing guests throughout the Italian Mediterranean and the Adriatic. For its part, Splendour of the Seas will homeport at Venice for its entire Europe season and alternate seven-night Greek Isles and Greek Isles & Turkey itineraries. The ship will reposition from Sao Paolo, Brazil to Barcelona for a 14-night trans-Atlantic voyage on Apr. 25, and then start its Europe season with an eight-night Italian Mediterranean and Adriatic itinerary from Barcelona to Venice. Splendour of the Seas concludes its Europe season with a seven-night Western Mediterranean cruise from Venice to Barcelona on Nov. 15, before returning to Sao Paolo on Nov. 22 on a 15-night westbound trans-Atlantic itinerary. Royal Caribbean cruise prices in the Mediterranean will rise by 10% for the summer 2013 cruise season, which is a move to return price levels back to being consistent with what they were in the past. The effects of the Costa Concordia disaster forced Royal Caribbean to more aggressively price their cruises to meet the lower demand that was created. But Royal Caribbean feels Europeans are returning to cruising and thus, the company wants to adjust their prices and schedule accordingly. 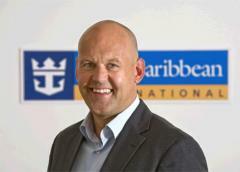 Royal Caribbean general manager Gianni Rotondo commented on the change, "At Genoa we have on a ship 3,800 passengers. After three years in Italy, we can increment rates by 10% because of the fact that the customer that we have acquired must be compelled to book in advance, which removes the risk of reducing prices 45 days prior to departure." In addition, Rotondo confirmed that five Italian ports for the upcoming summer season, adding Bari and Naples, "In Naples we can put Liberty of the Seas, the largest cruise ship operating in the Mediterranean, with excellent characteristics of onboard services." Royal Caribbean has seen a gain in market share in the Mediterranean by 8-10% and further increases could be on the way. Rotondo believes the final recovery of the cruise market could occur in mid-January, with the restoration of the usual advance booking for the summer holidays in the winter months. This was the norm before the Concordia incident. Looking at 2012 compared to 2010, Rotondo says combining 2012 and 2011, Royal Caribbean moved three times more passengers than in 2010 but at a decrease of 10% per fare on average. 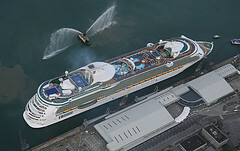 Royal Caribbean announced it will send just nine ships to Europe in 2013, down from 12 ships this year. Weak bookings in Europe have contributed to Royal Caribbean's decision to reduce its presence there. The nine ships will offer 276 cruises over 58 itineraries in 2013. 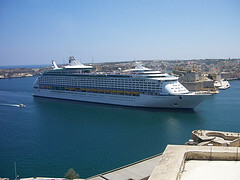 A third of the ships going to Europe in 2013 will sail out of the United Kingdom, including Independence of the Seas, Adventure of the Seas and Brilliance of the Seas. The ships will offer cruises to the Baltics, Mediterranean and Canary Islands. A report from the Passenger Shipping Association shows that more than 40% of British passengers choose to being their cruise from a UK port. 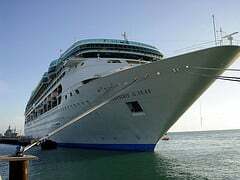 In addition, Legend of the Seas will offer seven-night western Mediterranean itineraries out of Genoa, Italy and visiting Provence (Marseilles), France; and Barcelona, Palma de Mallorca, and Valencia, Spain. Vision of the Seas will alternate seven-night Norwegian cruise to the North Sea and offer cruises to visit the Norwegian Fjords, Russia and other northern European destinations. Navigator of the Seas will offer seven-night eastern Mediterranean and Greek isle cruises. Serenade of the Seas will offer 12-night Mediterranean and Greek isle cruises. Splendour of the Seas will serve the Adriatic sea and Greek isles. And finally, Liberty of the Seas will offer a selection of five- and seven-night Western Mediterranean cruises from Barcelona. Royal Caribbean is betting on the Mediterranean by announcing that they plan on expanding their presence in the region. Royal Caribbean CEO Adam Goldstein on a trip to Milan, Italy talked about the cruise line's plans, "In 2012 we will double our presence in Italy, France and Spain. The economic crisis is certainly not hurting our industry, but the margins for growth in the Mediterranean are still sensitive and so we want to be players to play this game. " Just to support the development plans, Royal Caribbean is upgrading its fleet. Two new ships are scheduled to start operation in the coming years, being built in German shipyards instead of the Italian Fincantieri Meyer Wert shipyards. Goldstein, however, ultimately did not not close the door to future ships being built in Italy, "We know the value and experience of Fincantieri . So, as we say, we are 'open minded' and will reevaluate when the opportunity for new orders we will certainly take into account also the opportunities that may come from Italy. " What seemed like a gamble, when Royal Caribbean ordered and built two ships 220 thousand gross tons, but has been a success. "But this is our strategy," Goldstein says "The customer has any kind of offer to choose independently. So it is the same with ships, with a range of very different size." Phil Reimer of Canada.com recently took a cruise aboard Royal Caribbean's Liberty of the Seas on a Mediterranean itinerary and wrote about his experience onboard. 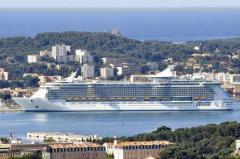 The cruise was out of Barcelona, Spain and visited ports in France and Italy. Reimer shared his advice for those visiting Toulon, France and what he enjoyed, "The best place to start in this city of 200,000 is at the La Rotonde fountain, next to a tourist office and with a choice of five roads in the roundabout. If you pick Le Cours Mirabeau, you will quickly run into Les Deux Garcons, a brasserie that dates back to 1792, where Cezanne was a regular and luminaries like Pablo Picasso, Edith Piaf and - I was told - Ernest Hemingway hung out." In Villefranche, Reimer enjoyed the variety of offerings to be found here, "From this port on the Cote d'Azur, better-known places like Cannes, Nice, Antibes, and Monte Carlo are all within reach. The train and bus stations are 15 minutes from the ship. The bus cost one euro, and in 20 minutes, I was in the heart of Nice." Once Liberty made her way to Italy, the port of Livorno offered Pisa and Florence and Reimer tried to do both but regreted that decision, "I chose to visit both, but hindsight tells me going straight to Florence would have been a better idea, given the limited time." For their stop in Rome, Reimer shared his plan for how he tackled this famous city, "From cruise ships, you walk 15 minutes from the Civitavecchia port gate and take the regular train to Rome for nine euros (return). You can get off at Rome's Saint Pietro station and visit the Vatican City to start your tour, or you can stay on to Romo Termini, the main station. The ``hop-on, hop- off'' buses take you right from there to watch your history lessons come to life - and to enjoy." "We are very pleased that the Nordic people finally seem to realize the great benefits of the cruise has to offer as a holiday. We like to think that cruise offers the best of two worlds: on the one hand, an all-inclusive, relaxing holiday in the sun, on the other hand, a cultural experience with stops at ports such as Rome, Sicily, Athens, Santorini, Rhodes, Istanbul and Jerusalem," says Meidal. Statistics show that Norwegian passengers account for the largest increase, by as much as 58 percent of the total increase. Swedes are in second place with 23 percent increase, while both the Danes and the Finns can boast of a 10 percent increase. The preferred holiday is a 7-day cruise with some of Royal Caribbean's largest and most innovative ships, such as the Liberty of the Seas.